Nokia devices don’t have the default option to take screenshots. So in case you want to take screenshots you have to look for other alternative solution. You can do it by using a third-party application known as Screenshot. However if you are an Android user, you can take screenshot on Android device without installing any application. 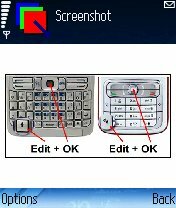 Screenshot enable you to easily take screenshots on your Symbian mobile phones. Once installed you can configure the shortcut key. The default shortcut is <Edit>+<OK>. The <Edit> key is also called as <Pencil> key. You can save the captured screenshots in JPEG, PNG, BMP or MBM format.The screenshots can be sent directly to PC or other mobile phones via bluetooth or infrared. The application is compatible with both S60 2nd Edition and S60 3rd Edition mobile phones. You can check the list of compatible mobile phones on the author website.